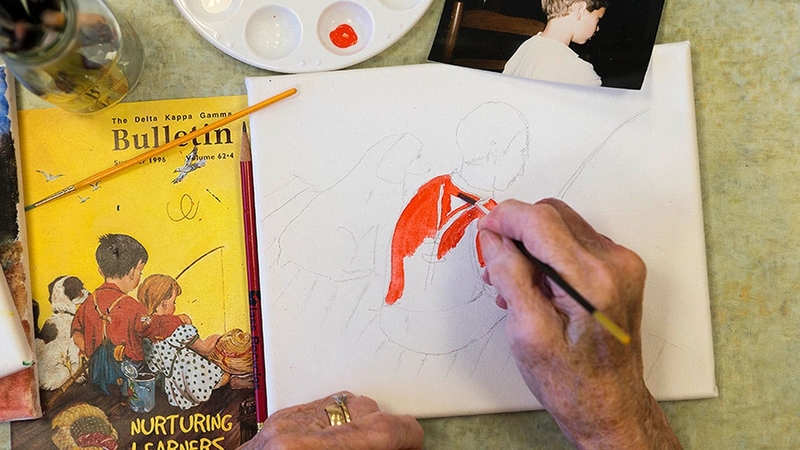 Working from a photo, Jeanette Brooks paints a portrait of her grandson during an arts class at Waltonwood in Cary. 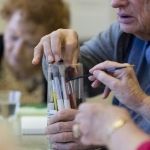 Experts say seniors benefit in numerous ways from hands-on participation in the arts. 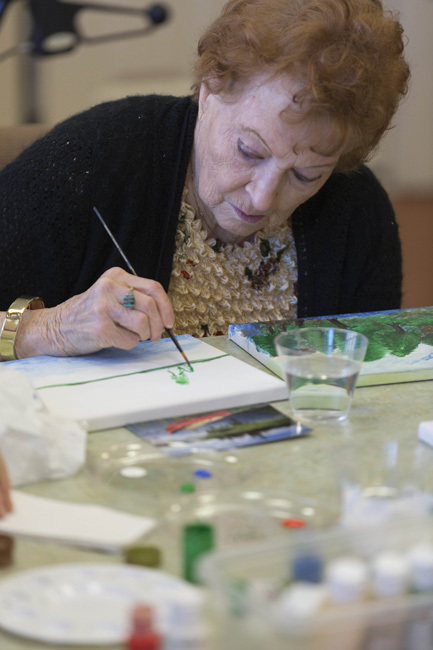 Joy Scott works on her latest landscape at a weekly art class for assisted living residents at Waltonwood in Cary. 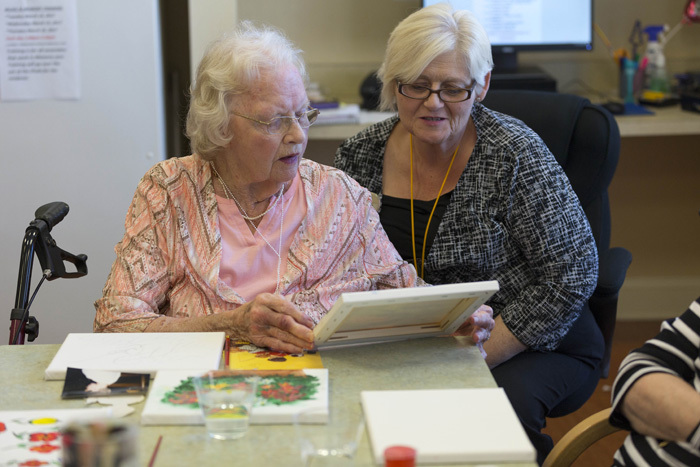 For seniors, “Art helps hand-eye coordination, and keeps the mind going through that thought process of creativity,” says Chester Williams, a retired art professor who recently added this class after teaching independent-living Waltonwood residents for more than four years. Jeanette Brooks bends her head toward the canvas, applying careful brush strokes to a portrait of her grandson and his dog. At the opposite end of the table, Joy Scott is painting a landscape, from a photograph. 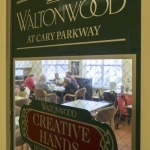 Both are students in a weekly art class at Waltonwood senior living community in Cary, led by sculptor and retired art professor Chester Williams. 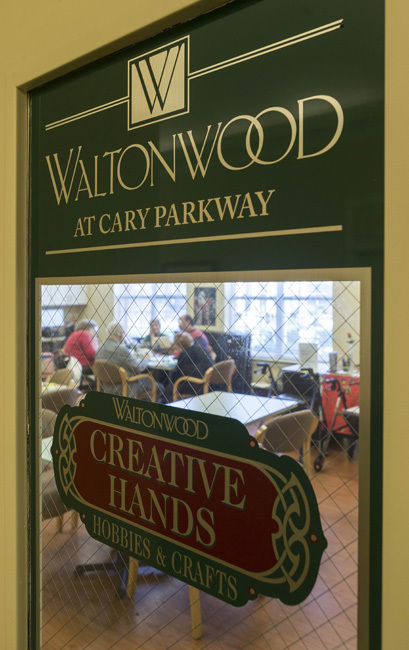 “Some of my students have experience, and others just want to take a look,” said Williams, who volunteers his time to lead separate classes for independent and assisted living residents at Waltonwood. 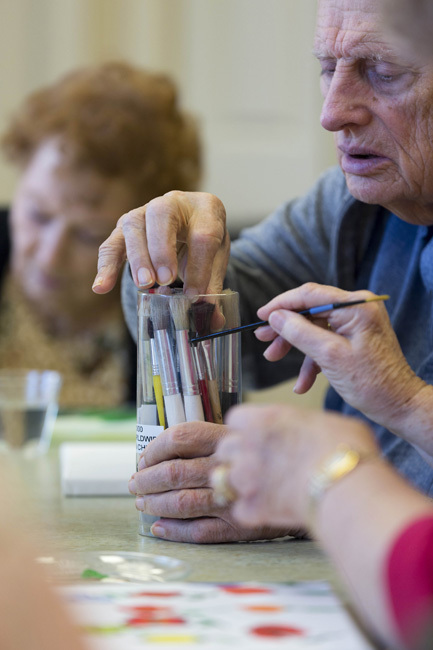 Much more than play, hands-on participation in the arts is effective in helping seniors compensate for the changes in their bodies, and keeps their minds active, says Cary art therapist Yael Divon. “It’s two different sides of the brain. 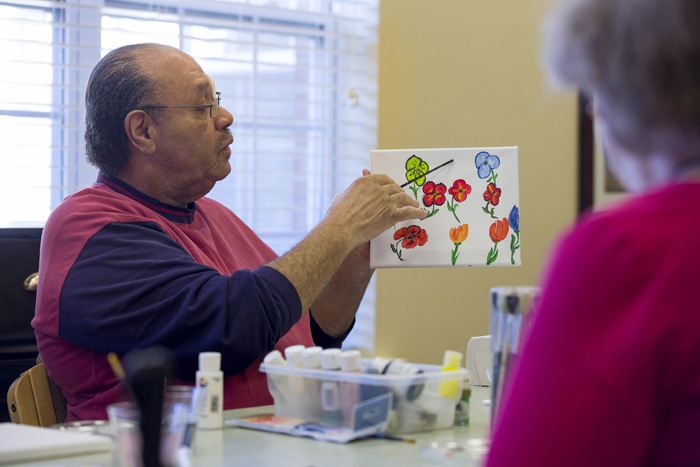 There’s the slowdown of the left side as we age, while the right side is still malleable, can still ‘grow,’” said Divon, who holds a master’s degree in art therapy and counseling and is the founder of Cary Art Therapy. “It can be cooking, gardening, woodworking, knitting, quilting — any type of art, anything you put your soul into, to create something from nothing. The capability is there; they just need the tools. From left are art students Jack Scott, Emily Doyle and Jeanette Brooks. Doyle takes the advice of teacher Chester Williams, choosing a smaller paint brush to fill the white space between her colorful florals. 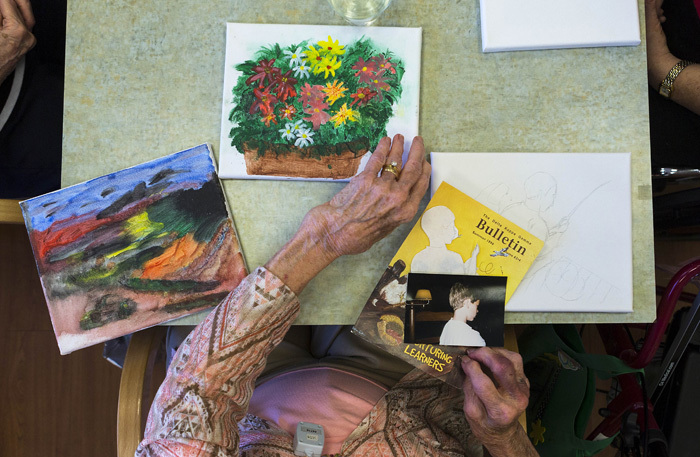 In her private practice, Divon uses many forms of art to help not just seniors but patients of all ages, through a range of conditions. Art can combat depression, help people manage addictions, sharpen motivation, and boost problem-solving skills, all for a better quality of life. 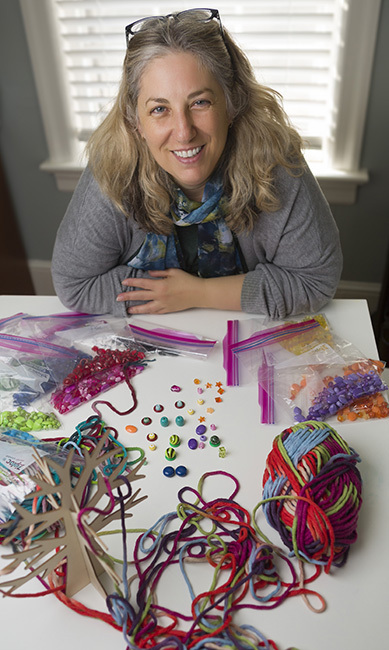 Divon also works at an area rehab facility with those who have suffered permanent brain injuries, including veterans, and she volunteers her services at local Down syndrome achievement center Gigi’s Playhouse. 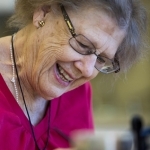 She’s even been on the other side of art therapy, making pottery while she was undergoing treatment for thyroid cancer. 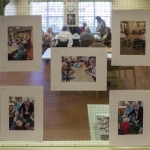 The arts are helping the elderly in a much different way at six local senior living communities, where the Holly Springs and Apex Sunrise Rotary Clubs have teamed up to implement Music & Memory, a nonprofit program used internationally. Music is making a big impact in the life of Beverly Norenton, seated, and others with memory impairment, through the Music & Memory program provided by the Holly Springs and Apex Sunrise Rotary Clubs to six local senior communities including Carillon Assisted Living in Fuquay-Varina. Assisting Norenton is Carillon staffer Shawanda Jones. 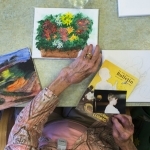 The program provides a personalized playlist to patients with Alzheimer’s or other memory impairment, through an iPod shuffle and headphones, tapping into their memories and helping them regain their social connections. Rotarians and staff were moved to tears by the reactions of patients hearing their playlists for the first time, Babson says, when the Music & Memory program launched at Carillon Assisted Living in Fuquay-Varina. One patient rarely known to speak began singing along to “Amazing Grace” almost immediately, in a video recorded that day. Her impromptu duet of “Jesus Loves Me,” with a fellow patient, followed. 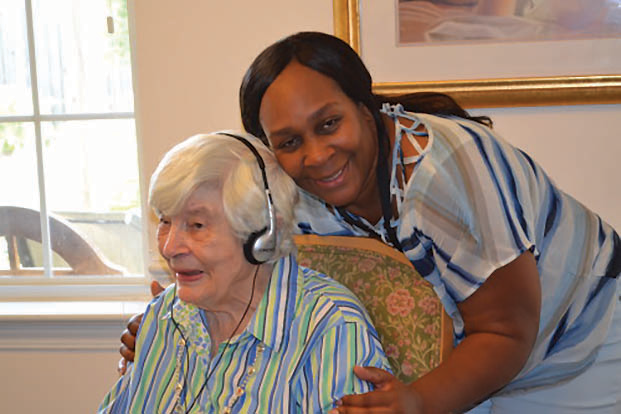 Christina Henderson, life enrichment director at Waltonwood, says Music & Memory helps calm Alzheimer’s patients and improves their cooperation with care staff. The costs of the program, including annual site certifications, the iPods and music, are covered through fundraising by the two Rotary clubs, and a Rotary district grant. Kaila Patel, secretary of the Holly Springs club, assists the senior communities in the Music & Memory certification process, and says the clubs hope to see the program expand. “We want to be sure we have a great support model for these six centers,” Patel said. Other sites that have implemented Music & Memory through the local Rotary clubs are Windsor Pointe in Fuquay-Varina, Spring Arbor in Apex, Sunrise of Cary, and Val’s Place in Raleigh. 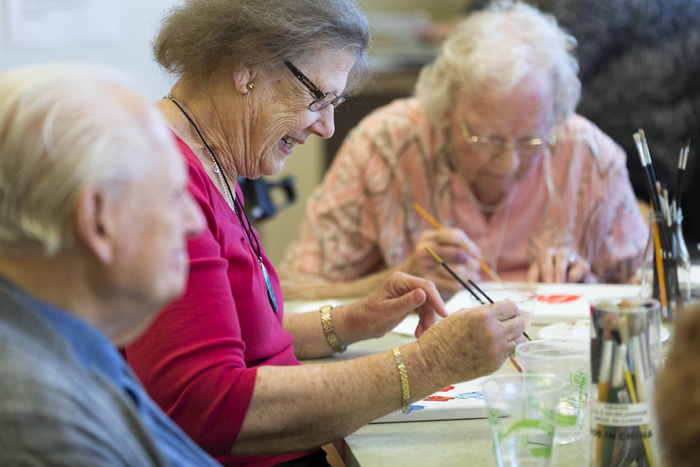 Art therapist Yael Divon says participation in the arts is effective in helping seniors compensate for the changes in their bodies, and keeps their minds active. “It’s not the results that are important, art-wise, but how you feel, that changes the outcome of your life,” Divon says. 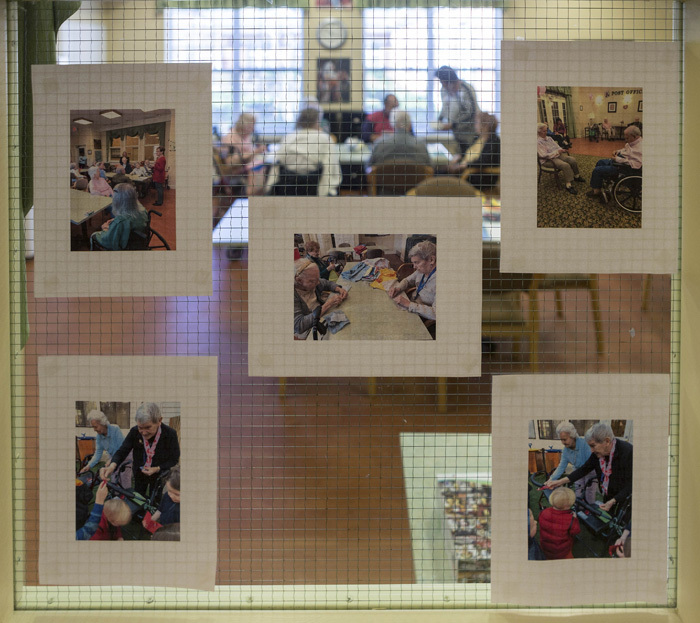 Henderson, of Waltonwood, points out additional arts initiatives there such as an annual art show and resident participation in April’s Wake County Senior Games’ Silver Arts, in painting, crocheting, knitting and poetry. 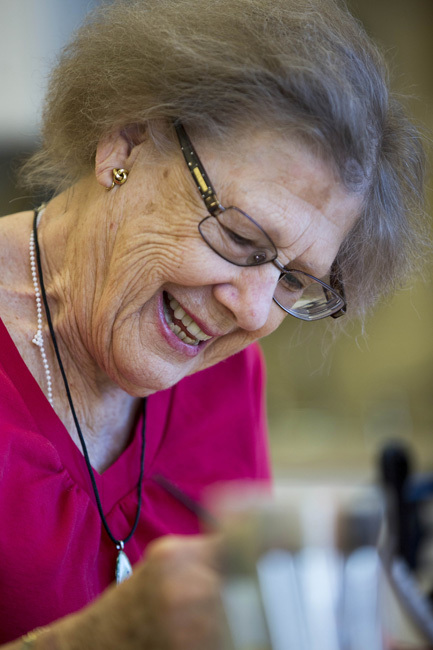 For seniors across Western Wake, opportunities abound to get involved in the arts via town programming. For up-to-date arts activity listings, look for program guides on your town’s website or call your local Parks, Recreation & Cultural Arts department. “Play therapy. Poetry, music, art, drama. Animal therapy. All of these are growing fields,” said art therapist Divon. “It’s not just about looking at museum works or listening to music; it’s hands on. “If your vision isn’t good, go 3-D by working with clay or fabric. And art can’t cure hearing loss, but it can change your perspective on it. You can still be creative, and it’s rewarding. It’s empowering. You come out of a session with something you can carry forward. 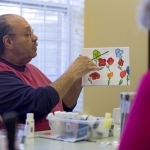 Artist and retired professor Chester Williams leads classes for seniors, at Waltonwood in Cary.